Steering should be adjusted properly for smooth turning of handlebars and safe running. Overtighten steering prevents smooth turning of the handlebars and too loose steering will cause poor stability. Check that there is no play in the front fork. 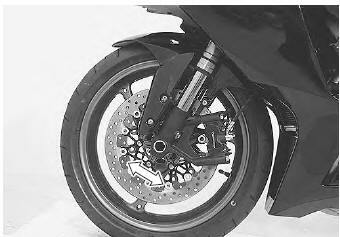 Support the motorcycle so that the front wheel is off the ground, with the wheel facing straight ahead, grasp the lower fork tubes near the axle and pull forward. If play is found, readjust the steering. Refer to “steering tension adjustment” in section 6b .